As we approach the holidays, the weather begins to get cooler, we have a little more down time for things like cozying up to a book and a warm cup of tea. Also, during the holidays, we tend to be friendlier and more willing to give to those in need. We attend church more and begin to celebrate the birth of Christ. I felt this was a great time to promote something that could be beneficial to how we navigate the season of giving. Since graduating college, I’ve been astounded and amazed at the things that my fellow ASU alums have been able to accomplish. I believe that supporting each other is one of the greatest and easiest gifts we can provide. Imagine my surprise when one of my buddies and fraternity brothers, Daniel, messaged me and told me about the book he had written. He asked me to read it and review it, so here we are. I’m so glad I read this book! If you’re a young person with any type of religious background, you need to read this book. If you’re a person who is already spiritually mature, you should read this book. A year or so ago, I wrote a blog post called, “The Church Kid that Left & Didn’t Go Back”. (https://www.livmagicalblog.com/blog/2017/6/14/the-church-kid-that-left-didnt-go-back) The blog post detailed the reasons that I decided to explore my spirituality outside of organized religion. Reading Daniel’s book, “I Am Church: Converting Passion into Praise”, solidified a lot of my reasoning, but also brought me back to one very important point: If you want to see more from church, you have to be the change. In the book, Daniel discusses how he was raised in a very religious family and was expected to follow in the footsteps of his father, who was also a pastor. As a young adult, he left his home in London, came to the US for college, and strayed away from church with no intentions of going into ministry. Eventually, things came full circle and he is now an author, speaker and ministry consultant. As I read the book, there were many things that stood out to me. Daniel uses bible stories, personal experiences and quotes that help paint a picture of how we should behave as Christians. One quote he used from Mahatma Gandhi spoke volumes for me: “I like your Christ, but I do not like your Christians.” (Did you just clutch your pearls, because I did when I read that.) Often times, we get so consumed in the organizational structure of religion that we forget the main point. God sent Jesus Christ to save mankind from himself. He wanted to spread the simple message that we should love God by loving ourselves and loving others, despite our differences. We should have respect for our fellow man. We should be the light. Daniel points out in his book that the world’s perception of Jesus does not come from the church or Christianity. It comes from you. As Christians, our words and actions help to paint of picture of His image. Daniel goes on to also point out that the only way people who don’t have a personal relationship with Christ will know that He loves them and wants them to be a part is by the manner in which Christians treat them. That is so important for us to remember. Church is not a building, a pastor, a choir, or a congregation. Church is you. Church is the good that you sow into the world. Delivering God’s message is not done only through a sermon or song. It is also, and most often, done through how you treat others. We are in a social climate that needs this message more now than ever. 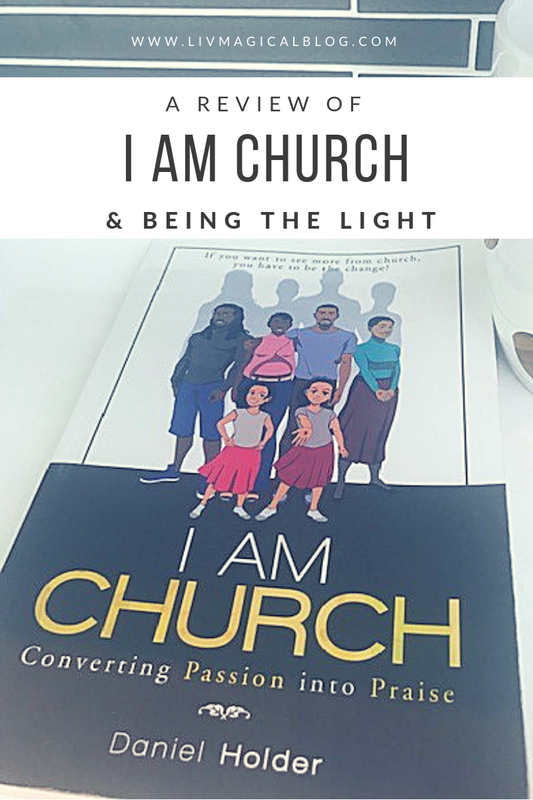 It is my hope that you’ll support my friend Daniel and Holder Ministries by getting a copy of I Am Church because it’s life changing. This is also the perfect season to give it as a gift! To get a copy, check out www.holderministries.com. Also, you can follow Daniel on Instagram and keep up with events and happenings at @holderministry.